Mama Francesca’s Latest Grated Cheese, Terzetto ~ Must Try! Y’all, the latest and greatest grated cheese from Mama Francesca is here…the Terzetto. I just love the way that sounds and rolls off the tongue. Makes me wish I knew Italian. 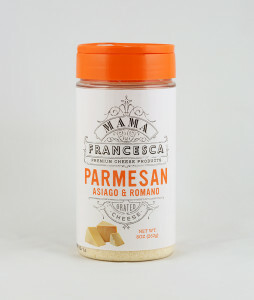 I digress…I’m here to let you know that the Terzetto variety of Mama Francesca’s gourmet grated cheese will be available in Walmart stores nationwide, starting April 21st. That’s Monday, y’all! I know I’m really excited to get a bottle of this in our freezer, as I adore the flavor combinations in the Terzetto. The asiago, parmesan and romano cheese combo is like the trifecta of Italian cheeses. Cheese trifecta y’all. Perfection. So, repeat to yourself, Terzetto. Terzetto, terzetto. And pretend you’re enjoying this new cheese atop some pasta or sizzling roasted potatoes, while sitting on the patio of an Italian cafe. In Italy. Or dusted on top of some sweet potato gnocchi. I’m almost drooling now. Keep a sharp eye out for the Terzetto cheeses in Walmart, and then get ready to gourmet-ify your favorite budget friendly dinners!